Our Heavenly Father is committed to your well-being. Think about that . . . God cares about you! Not only did He design you, He also has mapped out a perfect course for your life that will result in your utmost joy and fulfillment. But it requires your trust in His goodness and your obedience of His directives. Do you believe God has a wonderful plan for your life? Do you understand that the valleys of life always lead to mountaintops, if you are willing to follow God by faith? Meditate on the following promises of God. Ask the Holy Spirit to embed these truths into your heart so they become unshakable convictions that will guide you to a glorious destiny. Many, O LORD my God, are the wonders you have done. The things you planned for us no-one can recount to you; were I to speak and tell of them, they would be too many to declare. Psalm 40:5, NIV. 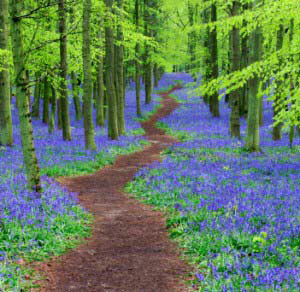 The LORD says, “I will guide you along the best pathway for your life. I will advise you and watch over you.” Psalm 32:8, NLT. For the LORD God is our light and protector. He gives us grace and glory. No good thing will the LORD withhold from those who do what is right. Psalm 84:11, NLT. Even strong young lions sometimes go hungry, but those who trust in the LORD will never lack any good thing. Psalm 34:10, NLT. Trust in the LORD and do good. Then you will live safely in the land and prosper. Take delight in the LORD, and he will give you your heart’s desires. Commit everything you do to the LORD. Trust him, and he will help you. Psalm 37:3-5, NLT. He fulfills the desires of those who fear him; he hears their cry and saves them. Psalm 145:19, NIV. If you remain in me and my words remain in you, ask whatever you wish, and it will be given you. John 15:7, NIV. This is the confidence we have in approaching God: that if we ask anything according to his will, he hears us. And if we know that he hears us–whatever we ask–we know that we have what we asked of him. 1 John 5:14, 15, NIV. You have granted him the desire of his heart and have not withheld the request of his lips. Selah Psalm 21:2, NIV.